ADIVAN offers a wide range of sophisticated products and services. 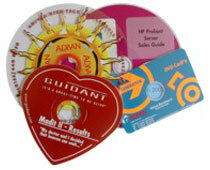 From CD, DVD and Recordable to Shaped CD/DVDs and CarD solutions. ADIVAN is pleased to process media manufacturing services for you. These pages introduce the optical media carriers offered by ADIVAN. Make your choice.